When it comes to primitive technology very few do it better than YouTube's Primitive Technology channel. 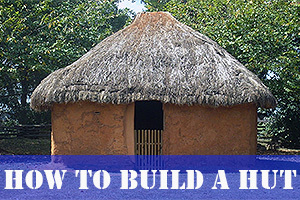 In this amazing video he shows you how to build a simple mud hut with a roof and a chimney. The hut is made by weaving wooden strips called wattle and then covering them in mud or clay. This type of building can be traced back at least 7,000 years, and is still in use all over the world. This is a great way to build yourself a simple hut/cabin that will not damage the surrounding ecosystem. Watch this video and be sure to subscribe if you like it.